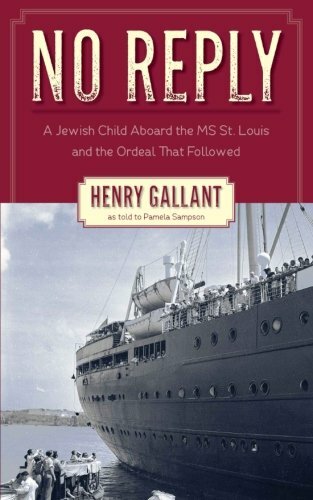 “No Reply” by Pamela Sampson is the emotional and historical memoir of Henry Gallant and his family's survival of the Holocaust aboard the MS St. Louis in 1939. There have been many books written on the persecution of the Jewish people during Hitler's terror. However, very few have been written about the impact on children and the refusal of many countries to provide a safe refuge. Sampson met Henry in 2014 at the 75th Anniversary of the MS St. Louis. Given that many refuse to accept the torture, and death of so many individuals, Sampson felt this story needed to be told. Many who have read or studied facts about the Holocaust still refuse to accept the facts, and there are continued debates over it today. Henry shares memories of his experience through the eyes of a 10-year-old to Pamela Sampson. Sampson writes a very emotional story about Gallant's survival and historical facts about the Holocaust. I have read many facts on concentration camps, Hitler’s medical experiments on the Jewish people, but very few books address the impact on children and survival. “No Reply” is a heartbreaking journey of 900 German-Jews on the MS St Louis, hoping to enter Cuba so they could eventually apply for immigration into the United States. Little did these individuals know that after paying exorbitant fees to the Nazis and anti-Semitic countries, their visas were not valid. Having no choice, the Captain of the ship sailed toward Florida hoping they would be allowed to enter. “No Reply” by Pamela Sampson is an excellent 95-page history that is very informative, a tribute to all who survived or lost loved ones during WWII. Regardless of denial about these events, a fact is fact.